The Island’s heritage railways have always been ‘chuffed’ about Christmas and worked hard to provide a number of festive options for families to enjoy and this year is no different. For the first time Santa’s Grotto will be in Laxey and special winter saloon Santa Trams will be running that magical journey, as passengers enjoy the beautiful winter scenery in anticipation of meeting the man himself. Trams will be departing from Derby Castle on the 15th, 16th and 22nd December and on the 23rd December trams will run from Derby Castle and Ramsey. At Laxey there will be entertainment, festive refreshments and face painting. Tickets cost £10 per adult and £8 per child, which includes a gift from Santa. For those that want to travel by steam, a special Santa Train will depart Douglas on the 8th December for Port Erin’s Dickensian Christmas Tree Festival. At Port Erin Station you can visit Santa’s Grotto, enjoy festive food and entertainment, the Christmas Market and late night shopping in the village. On the return journey, the young Magicians of Mann will provide on board entertainment. Tickets cost £10 per adult and £10 per child, which also includes a gift from Santa. Trains will also be steaming south during the 8th and 9th for a Medieval Christmas inside Castle Rushen. Lord Stanley cordially invites you to ride the train and join the Court in celebrating the Yuletide season. With talks, entertainers, plays, children’s activities and carols to get you ready for the festive period. Tickets cost £16 per adult and £8 per child but you can also ride the trains for normal fares (will not include entrance into the Castle), why not treat yourself to a festive brunch at the ticket hall before you board? 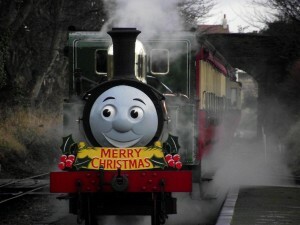 Finally, let the train take the strain this Christmas and ride the Shopper Special into Douglas. On the 8th and 9th December, avoid traffic and parking and steam into Douglas for your Christmas shopping. Normal fares apply and the Shopper special departs Castletown at 12:34 and 13:34. If you would prefer to avoid shopping in town altogether, contact the Welcome Centre on 01624 662525 for present ideas such as the 2013 Railway Calendar or gifts that provide enjoyment all year round such as discounted or free travel with a Rail Card or Residents Season Ticket. If you really want a unique present for that someone special, treat them to the ‘Ultimate Driving Experience’ where you can learn to drive one of our famous trams for the day.